While a task is running, you can reload a target database table using data from the source. You might want to reload a table if, during the task, an error occurs or data changes due to partition operations (for example, when using Oracle). You can reload up to 10 tables from a task. The task must be running. The migration method for the task must be either Full Load or Full Load with CDC. 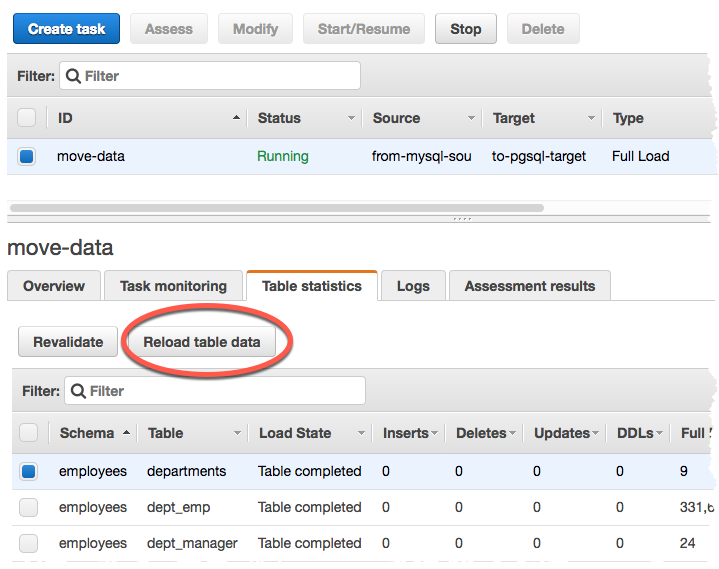 AWS DMS retains the previously read table definition and doesn't recreate it during the reload operation. Any DDL statements like ALTER TABLE ADD COLUMN, DROP COLUMN made to the table before the table is reloaded can cause the reload operation to fail. Sign in to the AWS Management Console and choose AWS DMS. If you are signed in as an AWS Identity and Access Management (IAM) user, you must have the appropriate permissions to access AWS DMS. For more information on the permissions required, see IAM Permissions Needed to Use AWS DMS. Choose Tasks from the navigation pane. Choose the running task that has the table you want to reload. Choose the Table Statistics tab. Choose the table you want to reload. If the task is no longer running, you can't reload the table. When AWS DMS is preparing to reload a table, the console changes the table status to Table is being reloaded.